I don't know about you, but I love Sandra Lee. Her semi-homemade style is great for busy people who still love to cook a yummy meal, and her demeanor is just so sweet and soft. Lee lives with her boyfriend, governor of New York Andrew Cuomo, in Chappaqua, New York in an amazingly decorated and designed home. I am in love. So today, we're goin' on a tour, people! Just look at that gigantic mirror in the entryway. I also love the charming display of umbrellas and that adorable boot collection! Cottage charm and traditional all rolled into one. 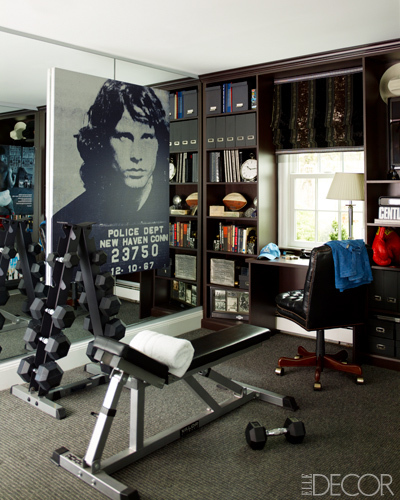 Here is the workout room/man cave. I usually am not very partial to dark decor, but this is done so well! Love that built-in desk facing a pretty peek-a-boo window, and all of the organized shelving. Seriously? Look at that amazing china display in the dining room! And those cozy upholstered chairs are totally calling my name. Fancified table linen storage and lime-y flowers add character and even more appeal! Just look at this calm, serene decor Sandra's got goin' on in here. Mismatched furniture lends charm and a perfectly imperfect look -- my favorite. 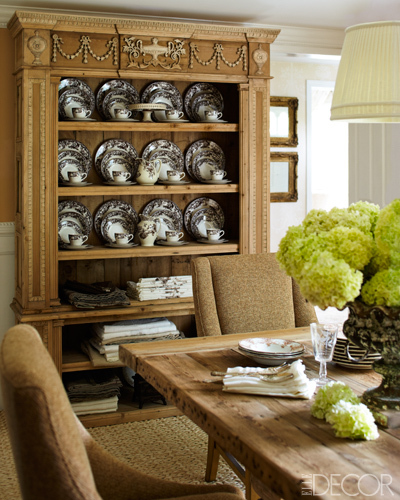 There is an amazing mix of contemporary and traditional pieces, which I love. And check out those fabulous candle sconces! Okay, people -- time to play the what's-your-favorite-part game! GO! Wow, such a cool home tour! I love her built in bookcases. When we have family get togethers we like play Apples to Apples! You know, I have never played that game! I have heard such great things about it, though! I am a big fan of mismatched furniture. My favorite way to decorate! What a gorgeous house! 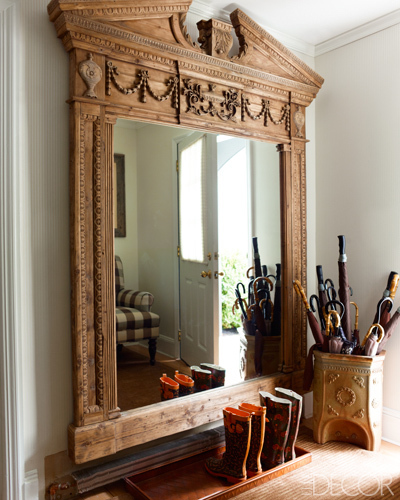 I love the large mirror in the entry way! Gorgeous! Had to pin a few of those. Happy weekend!